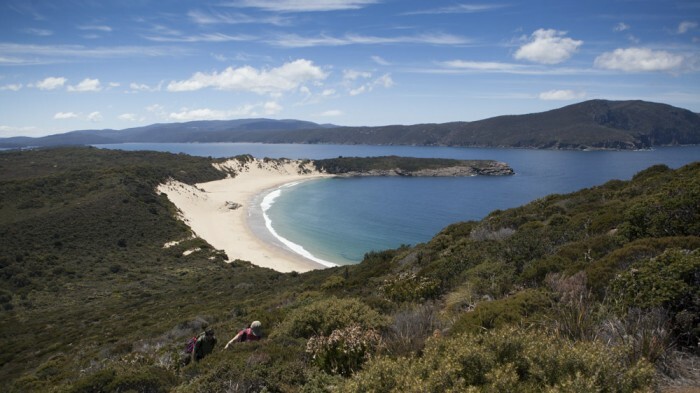 Tucked between the Remarkable Caves and Port Arthur, the Crescent Bay and Mount Brown track plays host to the most spectacular beach on the Tasman Peninsula, Crescent Beach. In addition to enormous dunes and beautiful crystal waters of Crescent Bay, the hike to the summit of Mount Brown offers hikers vast panoramic views of the peninsula’s rugged coastline. Each section can be walked individually or together totaling 8km and roughly 4 hours excluding breaks. View Google Map Directions From Hobart head over the Tasman Bridge and continue on the Arthurs Highway (A9), turning right at the main intersection in Sorell (sign for Tasmanian Peninsula). Continue for 70km until reaching the town of Port Arthur. Take the first left once leaving the township onto Safety Cove Road. Continue along this road until it’s end at the Remarkable Caves carpark. The walk begins 20m back up the road on the eastern side. The trailhead is located 50m before the Remarkable Caves carpark and heads east firstly towards Mount Brown. The first 1km of the hike crosses a series of undulating sand dunes covered in coastal heath vegetation. This section is easy going and it is highly likely you may cross paths with echidnas during warmer months. This section of the walk offers westerly views back towards the Peninsula cliff line, the most notable inclusion being Cape Raoul. 20 minutes into the walk a gaping cavity that is the Maingon Blowhole is reached. Care must be taken when viewing the blowhole as the edges appear quite fragile. A short side trail can be taken here to explore the rocky coast and gulch below. The track then skirts the coastline for another 1km before heading inland onto the lower knolls of Mount Brown. The track to the summit of Mt Brown isn’t signposted but is easily noticed. A series of cairns will direct your ascent of the mountain. The walk is moderately steep and many sections consist of small loose shards of rock so care should be taken. 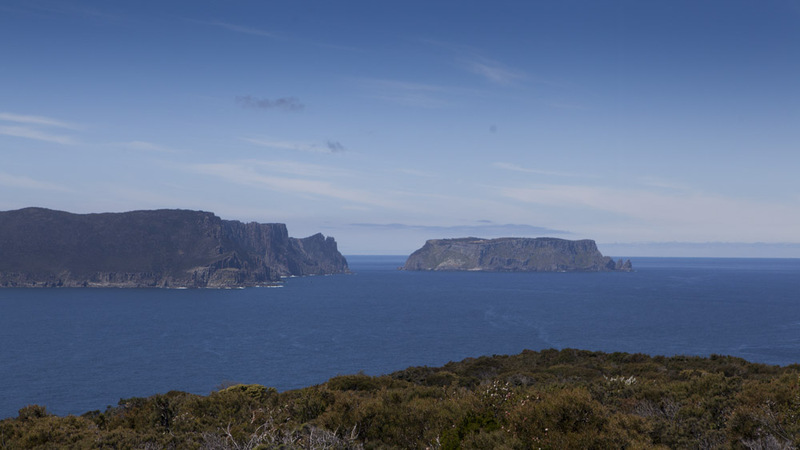 From the summit trig point Cape Pillar and Tasman Island, Arthurs Peak and Port Arthur’s Carnavon Bay are all revealed as well as views further south to Cape Raoul and Bruny Island. A further track to Mount Brown’s edge can be found to the west taking in views of Dauntless Point and Black Rock. Retrace your steps to return to the main track. Once back on the main track the southern end of Crescent Beach is quickly reached. From here it is highly recommended that you experience the true magnitude of the sand dunes by scrabbling your way to the top. The beach is incredibly beautiful and often sparsely populated, making it a wonderful spot to take an extended rest stop. The route is then retraced to return to the car park. There are many steep cliffs along the coast line of Mount Brown. Additionally, care must be taken when viewing the Maingon Blowhole. Sections of the Mount Brown ascent can also be steep and slippery.